Decorating the nursery room can be an exciting duty and it prepares you for the arrival of your newborn. One of the most important acquisitions that you will make is a glider or rocking chair. But with dozens of features and styles available, looking for the best glider for the nursery can be a difficult task especially for new parents. It is easy to lose focus when setting up a nursery. New parents may fill up the room with things that their child would like, instead of need. One of the important features of a carefully planned nursery is a glider. Why Do You Need A Glider? Babies can easily sleep and be comforted with the back-and-forth motion of a glider, making it one of the essential nursery items for generations. They are also the best place to feed, cuddle, and have bonding time with your baby. Surely, you and your little one will be spending a lot of time in a nursery chair. It is important to select the right one that you can be acquainted with over the next months and years. Gliders today come with plenty of padding. Some chairs also provide an ottoman so parents can rest their feet comfortably. There are also stylish chairs that also look great in even in living rooms and porches. Gliders are often high-priced, but they will be a part of your home for years. When looking for the best glider for the nursery, make sure that it meets some of the following requirements. What To Consider When Buying A Glider? A rocker or glider for the nursery is one of the places where you will spend the most of your time as a parent. Here are some things that you have to look for before making a purchase. With the continuous feeding sessions and long restless nights, it is just right to have a glider that provides enough back and head support. You may look for chairs with padded and wide armrests. Babies can be heavy and after twenty minutes, you are going to need support from armrests for better positioning. In addition to having space for changing position easily, you will want your feet to rest on the floor at a comfortable angle. You may also consider having footrests or ottoman that matches the chair like the Stork Craft Hoop Glider and Ottoman Set. This lets you elevate your feet while taking pressure off the back. You will appreciate the boost to position tired legs. Moms who are suffering from lower back pain may select gliders with lumbar support. 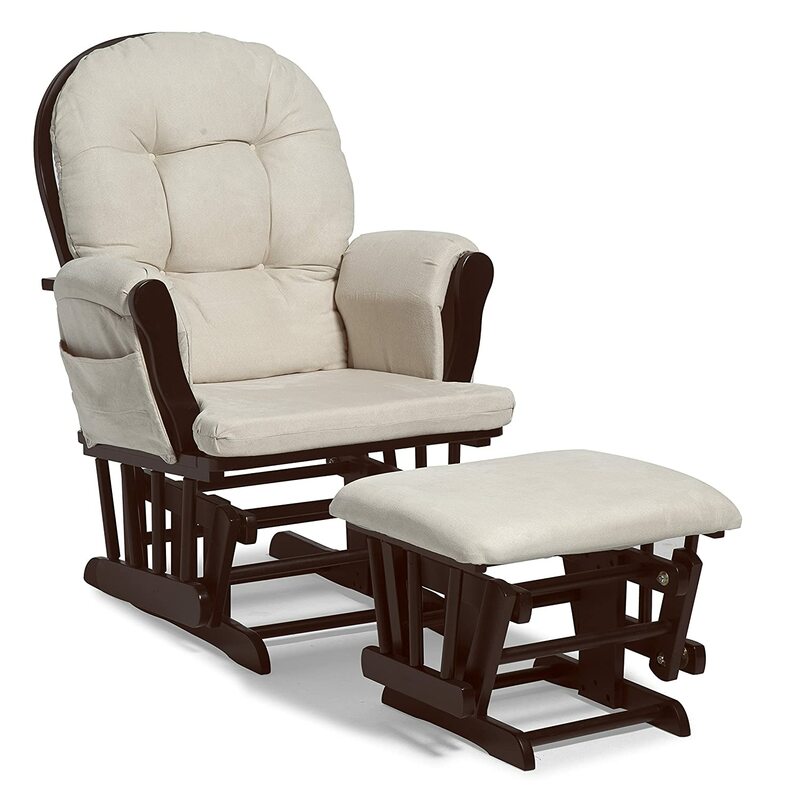 Whether you choose a glider or a rocker, make sure that it has a well-built and durable frame. You will want to invest in furniture that lasts for years. This allows your child to use the chair even after the nursing years. It is important that the materials used are of good quality. A glider has a tendency to pinch little toes and fingers, especially for active and curious toddlers. To prevent accidents, the chair should not move when not in use. Some gliders come with built-in locks to keep the chair from moving back and forth. Make sure that there are no sharp points and uncovered hardware. You can also check underneath the chair as your baby will start crawling soon. Chairs with locking mechanism like Mikayla Swivel Gliding Recliner allows parents to control how much the chair reclines. Make sure that you can operate it easily from while sitting down while holding your baby. It also makes it easier for parents to stand up without waking up their babies in their arms. By using locks, it can prevent your little one from getting hurt when your toddler starts to play. You will want also the locks to be encased and out of reach. The best glider for the nursery comes with the washable or removable cover. From drool, spit-ups, accidents with his diaper, throw-ups, and more, this chair is sure to get dirty. You might also have to wash the seat and cushions once or twice a month. You will want to an easy-to-clean and stain-resistant fabric to help you clean up when things get messy. Keeping the covers clean can also help in prolonging its life. When looking for the best glider for the nursery, consider how you might use it in the future. The chair may seem perfect for your baby’s room right now, but what about five or ten years later? After your little one has outgrown it, you will want this comfortable chair that is not solely used for the nursery. Some chairs can be converted to stationary chairs by adding feet, allowing parents or kids to style and choose the fabric according to their preferences. The best glider for the nursery should take your baby from cradle to college, like Naomi Home Brisbane Glider & Ottoman Set. This chair for nursery by Baby Relax provides a supportive spring core foam filled a seat with the size of 41.75 x 30 x 37 inches. It has an enclosed ball bearing mechanism for smooth gliding motion and a rotating swivel function. This stylish chair is also easy to clean, which is helpful to help parents save time. Offering 3 functional positions, this recliner lets you find the right position. 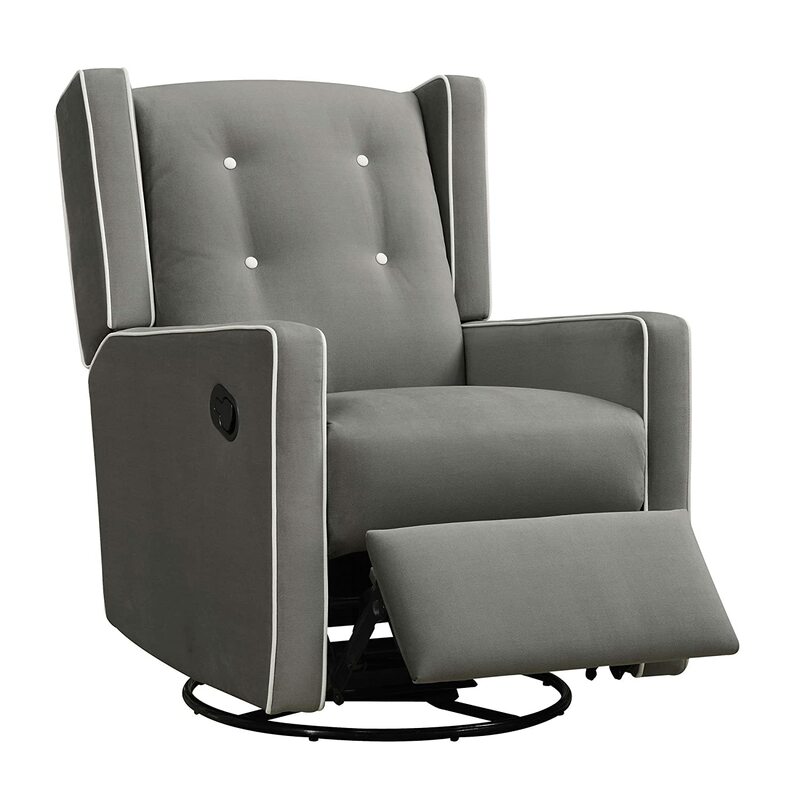 Mikayla Swivel Gliding Recliner offers three functional positions. This allows parents to recline, swivel 360, and glide. The track arm design provides a comfortable area to rest your arms, which is helpful when holding the baby for extended periods of time. 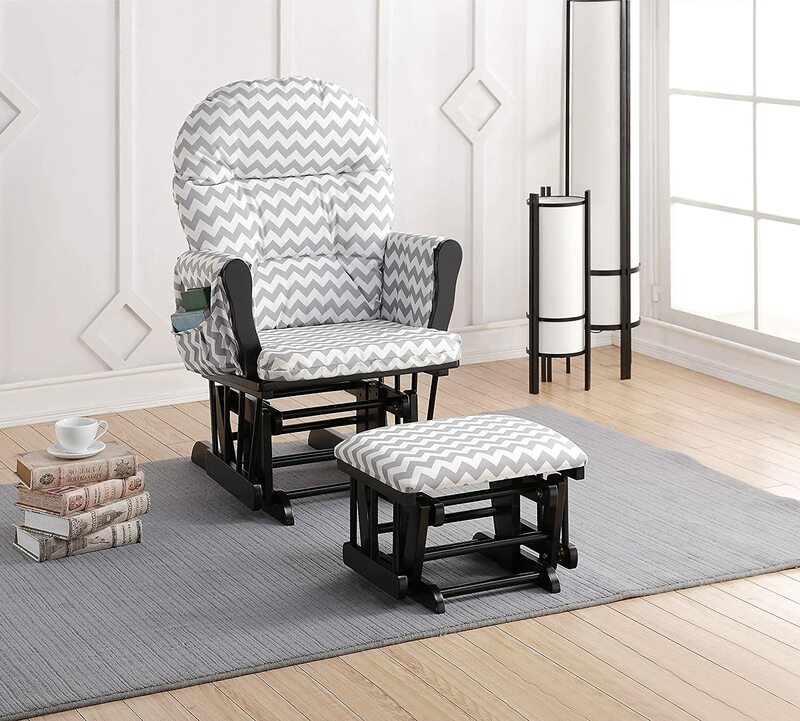 Parents can easily control the movement of the chair with the convenient lever placement, making it a good place for relaxing, snuggling, and feeding. Its elegant white welt trim accentuates the shape of the recliner and provides additional style to any room. Made of microfabric, this recliner is velvety soft and easy to clean. This recliner comes with feet support and helps in alleviating pressure from your back. This chair may produce squeaking sounds. It is too heavy, making it difficult to carry from one room to another. Hoop Glider and Ottoman Set by Stork Craft features metal, enclosed ball bearings for a smooth glide motion. This helps parents and babies unwind and have comfortable feeding sessions. Both seat and back cushions are hand washable, letting parents keep this chair fresh and clean. It also comes with a padded ottoman so parents can put their feet up while nursing their babies. Constructed of solid wood and wood products, this chair by Stork Craft lasts for years. It comes with padded arm cushions that feature two side pockets. These let parents store toys, baby books, and other small items so they are within reach. Ottoman included, parents can place their feet up while feeding or comforting their babies to sleep. The enclosed, metal ball bearings let ottoman glide smoothly. The cushion colors and neutral finishes easily blend with any nursery or home décor, making it one of the most popular choices. Made of microfiber, both seat and back cushions are spot cleanable, keeping the appearance fresh and clean at all times. It may produce mild squeaking sounds but not loud enough to wake the baby up. The cushions do not have enough padding and can be uncomfortable after extended periods of time. The Brisbane Glider & Ottoman Set with Cushion by Naomi Home is designed to grow with your child. It fits in the nursery and can be transferred to the living room or den as the child grows. The ottoman lets you rest your feet while reading bedtime stories or watching your little one sleep. The smooth gliding motion offered by this item helps both child and parent unwind during late night feedings. This glider by Naomoi Home fits not only in the nursery but also in the living room, making it grow with the child. It comes with an ottoman that lets you put your feet up during feeding sessions or bedtime stories. This furniture offers plenty of comfort with its generous seating area and padded arms, adding style and comfort to any room. Its smooth gliding motion helps your baby go back to sleep in the middle of the night. Made of 100% polyester, this comfortable and soft chair is easy to clean. This gives you plenty of time to have bonding time with your little one. The cushion at the back of the chair may slide down many times when sitting and has to be tied again. This Semi-Upholstered Glider by Graco comes with ultra-plush microfiber cushions that let you glide in comfort. The cushions are 100% microfiber and are spot cleanable, keeping the look tidy and clean. Made of high-quality rubber wood and composites, it comes with ottoman that lets you rest your feet comfortably during late night feedings. When not in use, you can fold it in the provided safe storage. This semi-upholstered glider comes with fully-padded cushions that deliver premium comfort. The cushions are 100% microfiber and are easy to clean, making it easy for parents to keep the chair neat and tidy. Both the glider and nursing ottoman have enclosed metal ball bearings for smooth gliding motions, helping your baby rest and sleep. The accompanying ottoman lets you rest your feet comfortably while feeding your baby or reading bedtime stories. Its style complements not only the nursery room but also other rooms. Upholstered ottoman and glider are available in beige/espresso, white/gray and cherry/beige combinations. This chair may produce squeaking sounds while swinging and sitting, but not loud enough to wake your little one up. The padded arms may be difficult to remove when it is time to clean them up. The Upholstered Swivel Glider by Davinci Olive is made of 100% soft and durable heathered polyester fabric. It has the high back with lumbar pillow included for additional back support. Free of chemical flame retardants, its metal base allows smooth 360 swivel motion and gentle back and forth gliding. It also comes with upholstered ottoman for a place to rest weary feet. 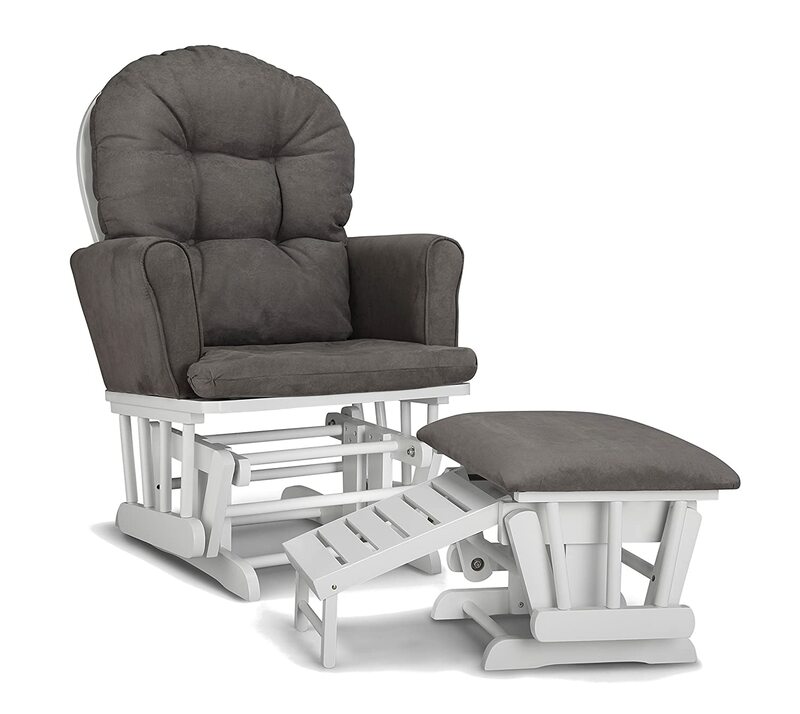 In addition, this comfortable nursing chair also provides a plush popup leg rest. This well-designed glider is useful not only during the feeding time needs but also in the later years. Its swivel metal base allows smooth and gentle 360 degree motion, letting you and your baby relax during late hours. The bonus upholstered ottoman lets you rest your weary feet during bedtime stories or feeding sessions. This chair comes with a lumbar pillow for additional lower back support, which is useful for parents who have lower back problems. Made of 100% soft and durable heathered polyester fabric, its highly cushioned back design provides extra head and neck support. This chair has a streamlined design with a plush popup leg rest feature that lets you elevate your legs in a comfortable position while feeding your little one. This chair may produce mild squeaky and creaky sounds when rocking, but not loud enough to wake the baby up. A glider is one of the best investments that you can make. This will give you and your baby a comfortable place for feeding sessions, reading bed time stories, and other bonding moments. Before choosing the best glider for the nursery, make sure that you also consider its safety, durability, versatility and comfort. 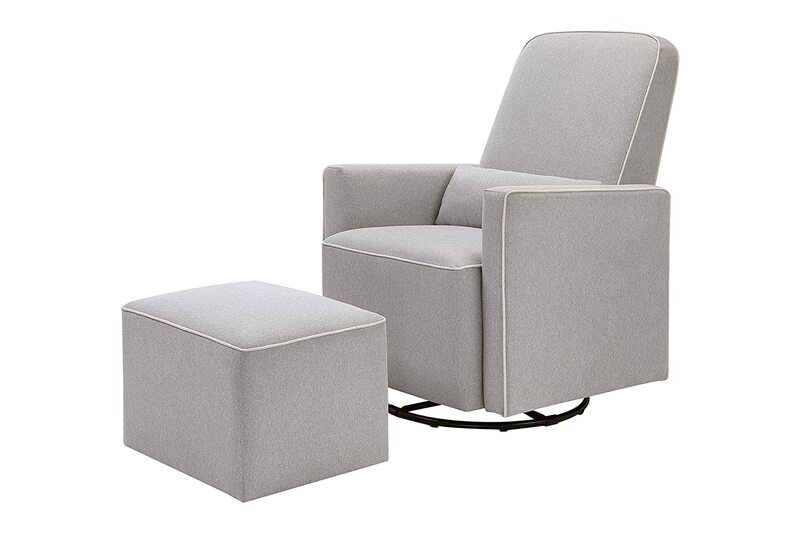 If you are still having a hard time deciding, we recommend DaVinci Olive Upholstered Swivel Glider with Bonus Ottoman. It has soft and durable heathered polyester fabric, ottoman, and a lumbar pillow for extra back support. Its metal base also lets you glide back and forth gently and move 360 degree smoothly.